Like Alexander Wang, I'm also a big fan of inspiring street style. The common uniform this Fall? Leather biker jacket, clunky boots or studded heels, massive hold-all bag, skinny pants and oversized boyfriend sweaters. Street style looks are often thrown together, unfussy and effortless but still responsible for showcasing creative designs from the worlds best designers. It's a way of cultivating your own sense of aesthethic! My favorite is the pale gray mini dress! Amazing pics!! 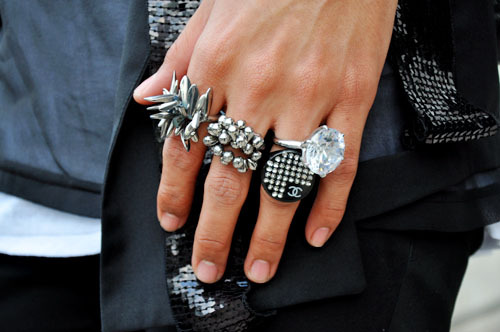 Love the first booties and the picture of all the beautiful rings!! ... And ofcourse all the outfits, they're amazing! !